New stainless steel PEM® TK™TackSert® pins from PennEngineering® introduce ideal alternatives to screws for attaching thin panels in assemblies. They can securely attach panels of any material to base panels manufactured from common casting materials (such as AZ91D) or plastics (such as ABS and printed circuit boards). Unique design features promote reliable performance in service. PEM TK TackSert pins deliver multiple advantages over screws by eliminating any need for mating threads from tapped holes or inserts and the rework frequently required due to screw cross-threading and driver bit “cam-out.” Patches intended to prevent fastener loosening in service are unnecessary. 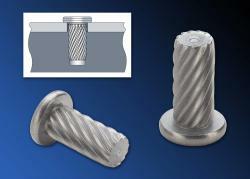 Among pin design features, a tapered tip assists in pin location to enable easier alignment into a base panel, a specially engineered diagonal broaching knurl (instead of threads) creates a firm interference fit without hole-tolerance issues, and a low-profile head minimizes protrusion on the attached panel. The pins are offered in a variety of lengths and can successfully attach sheets with thicknesses from .067” / 1.7mm to .185” / 4.7mm, depending on pin length. For plastic base, simple press-in installation without using heat or ultrasonics is performed by preparing properly sized mounting holes in the top sheet and base panel, placing the pin through the hole in the top sheet and into the through or blind mounting hole of the base panel, and then applying sufficient squeezing force using punch and anvil until the head of the pin contacts the top sheet. Pins can even be installed automatically for high-volume jobs.